I read 14 books in September, and I have reviews for 8 of those books (plus one from August) here today. If you're looking for more book recommendations, check out the linkup at Modern Mrs. Darcy. I shared my August Quick Lit in September, which was packed with books, and then two additional full reviews: The Winter Sea by Susanna Kearsley and The Alice Network by Kate Quinn. Y'all, I loved The Alice Network and didn't review it for months because I couldn't put my love into words. It was an excellent read. Some of my favorite September reads aren't featured here because I'm doing a separate review for them: the Blue Heron series by Kristan Higgins. I raced through all five books three days - they were that addicting! But my favorite read of last month, Tower of Dawn by Sarah J. Maas, was my most anticipated, too. I should be reviewing it here soon, but needless to say, it didn't disappoint. I love those characters so much! 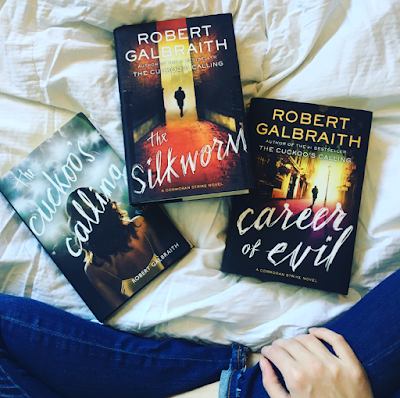 THE CUCKOO'S CALLING, THE SILKWORM AND CAREER OF EVIL BY ROBERT GALBRAITH | These books weren't even on my radar until it was revealed that Robert Galbraith is a pen name for J.K. Rowling. The mystery mood struck me at the end of August, and I quickly binged the first three books in this series. Rowling's writing is, as expected, fantastic. I thought the mysteries were surprising and the characters were very engaging. The first mystery was my favorite because it was the most procedural. The tone definitely changes in the second and third mysteries - they're much more gruesome/gory. Truthfully, I had to skim a few parts in those books. But I wasn't really reading for the mysteries at that point: Detective Cormoran Strike and his assistant, Robin Ellacott, were the real draw. I love them so much, especially slowly uncovering the backstories. The pace is a bit slow in these books, and the writing is definitely descriptive/detailed. Additionally, I'm slightly convinced that it's impossible to actually solve these mysteries until the end (but I may just not be any good at keeping track of clues along the way). Regardless, this series was so good and reminded me of why I do enjoy this genre from time to time. And now I'm dying to get my hands on the fourth after the cliffhanger of the third! TOO GOOD TO BE TRUE BY KRISTAN HIGGINS | I finished Higgins' Blue Heron series and wasn't ready to say goodbye to her writing, so I picked up one of her standalones. Unfortunately, it was a dud. The humor is definitely still there, which is the main reason I finished the book. But the heroine drove me crazy: 1) giving your sister and ex-fiancé permission to date is SO WEIRD, 2) stop making up fake boyfriends and 3) why are you THIS obsessed with the Civil War?! And even the romance didn't redeem it because that was so rushed and then oddly melodramatic at the end. I'd say I'm So Okay With It, which is a bummer. HELLO, SUNSHINE BY LAURA DAVE | I was wary when I picked this up because I hated Dave's previous book. However, I was immediately hooked by the premise: a foodie with a popular YouTube cooking show is revealed to be fraud. While I enjoyed Dave's writing, I felt like everything needed more development. It felt like the book needed to be longer, and I don't typically feel that way. The ending was rushed and unsatisfying, and the themes were so promising (how keeping up a public persona affects your personal life) but never went deep enough. I debated the rating because I did like some of it, but I think I'm just So Okay With It overall. BROKEN HARBOR BY TANA FRENCH | I don't read a ton of mysteries, but I definitely gravitate towards psychological ones when I do. I know that's why I've enjoyed the previous books in French's Dublin Murder Squad series. She definitely focuses on the why of a crime more than the who. Sadly, however, this one didn't really work for me. The detective annoyed me, the secondary story involving his family felt largely unnecessary, the resolution of the mystery felt completely implausible and the book could have been 100 pages shorter (at the very least). I still love French's way with words, but not much else. It's definitely a So Okay With It. THE MAGIC OF MOTHERHOOD BY ASHLEE GADD | This was one of those "just browsing Target and walked out with $100 worth of stuff" situations. I hadn't heard of this book before (or the blog Coffee + Crumbs). Honestly? I just liked the title and fell prey to the siren call of the red bullseye. When I finally picked it up, I was pleased that this spontaneous purchase was a winner! This collection of essays made me tear up, laugh, and underline like crazy. I found it relatable and encouraging. I So Loved It: both the celebration of motherhood and the commiseration over its difficulties. Plus, the book itself is lovely and will make a fantastic gifts for new mothers. DEAR FAHRENHEIT 451 BY ANNIE SPENCE* | The cover of this book caught my eye while I was browsing NetGalley one day, and I requested it as soon as I read the subtitle: A Librarian's Love Letters and Break-Up Notes to the Books in Her Life. Although I do like the concept and books about books, Spence's writing just didn't work for me. I didn't connect with her humor, found the profanity gratuitous after a while, and ultimately found the book too gimmicky. But my biggest issue? She didn't make me want to read any of the books discussed! Ultimately, I'm So Over It - but I do think there are readers who will enjoy it if they share her taste in books. THEIR FRACTURED LIGHT BY AMIE KAUFMAN & MEAGAN SPOONER | I loved the first book in this series but found the second book a little disappointing, which probably explains why it took me so long to read this conclusion. I just wasn't hyped for it! Although the "whispers" remain my least favorite part of this world, I found the world less confusing in this installment (and the pacing was better). I loved Gideon and Sofia, and I was so excited to see them interact with Lilac + Tarver and Jubilee + Flynn. The resolution was pretty satisfying, but I'd probably just say I So Liked It. It was fun while I was immersed in it, but I don't see myself re-reading it in the future. I'm so intrigued by The Magic of Motherhood! Any parenting type book can be hit or miss for me though, so I was hoping my library system would have it, but they don't :( I'll have to decide if I'm going to take the plunge and buy it! I really enjoyed the Robert Galbraith (aka JK Rowling) detective series. I've got the first few episodes of the tv series on my laptop to start watching on my flight tomorrow.